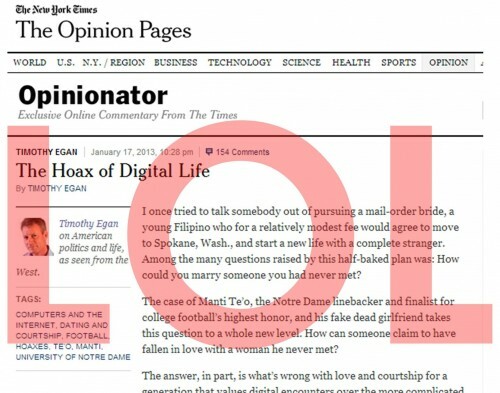 And a writer named Timothy Egan went full on Jedi-status digital dualism last night in a piece for the New York Times about the Te’o story titled, “The Hoax of Digital Life.” He views this radical outlier of a case as “a compelling parable of digital dating culture,” and begins both by indicting “the nature of people who develop relationships through a screen,” and arguing that there is “a generation that values digital encounters over the more complicated messiness of real human interaction.” Egan states that “the Internet is the cause of much of today’s commitment-free, surface-only living,” as if that possibly could be the case. His assertion is far afield of the lived experience of many people who use digital tools and know well their real, human, messiness. To fall in love requires a bit of unpredictable human interaction. You have to laugh with a person, test their limits, go back and forth, touch them, reveal something true about yourself. You have to show some vulnerability, some give and take. At the very least, you have to make eye contact. It’s easier to substitute texting, tweeting or Facebook posting for these basic rituals of love and friendship because the digital route offers protection. How can you get dumped when you were never really involved? This is one of the tell-tale signs of digital dualism: the false idea that there is an on- and an offline that exist as a zero-sum trade-off, where time spent on one means less time on the other. This belies research demonstrating that those who use digital tools to socialize more also tend to socialize more face-to-face and do more things away from the computer. [Te’o]’s a victim of his age, people who are more willing to embrace fake life through a screen than the real world beyond their smartphone. Egan’s language here, while laughable for many readers of this blog, is worth not ignoring because it is pretty typical of how many discuss the Internet in op-eds, the news, and around kitchen tables and water-coolers. What needs to be insisted in response is that what happened in the Te’o case involves real deception among real people with real motives. The point isn’t that there exists a digital world that’s fake; it’s that there isn’t a digital world. The hoax is the invention of some cyber-reality we’ve traded the offline for, where interaction is fake. The hoax is this conceptual error that Egan and other digital dualists rely on to make many of their arguments. These writers get mileage out of calling this a “digital deception,” and declare the Internet “fake” in order to have a convenient answer (“technology!”) for real, messy, complicated, human problems like celebrity, romance, and deception. Blaming technology also provides a simpler solution: “less technology!” And, as I discuss in my IRL Fetish essay, by constructing the digital as some “other” place, and then judging that place as “virtual” and less real, one can then value their own non-use as more human and deep. Ultimately this trend may be less about putting down the digital and those who use it, and more about propping up one’s own non-use. And those reading these types of articles who are not highly involved with the Web or mobile devices can congratulate themselves. As always, be very skeptical of those who find themselves worthy arbiters of who is more and less human or real. I'm currently working for a boss who gets called a 'cyber psychologist'. I find it very odd as if the internet has a brain of its own. And it leans towards research/theory which suggests online interactions, as you say, are distinct and separate from the 'real world'.But there is quite an established body of work which takes the 'cyber' prefix seriously and it needs pulling apart! I'll try and do my bit. Hits the spot -- I'll share this post with my students next week. Thanks. Been studying all about this recently in my class. Love the post.. if you have anything else in relation please share!! The Internet is a built environment. So are cities. The idea of dualism is, as you point out, not useful. Still, like cities, the internet has a relationship with, say, biology, or the planet, or things like that, whatever they are called ... which is as dynamic and problematic as that of cities. Problematic, because the biology, free of the dominance of the built environments, needs to survive if the built environments are to survive. One way is for greater integration, for technological fixes, but the tension is still there for some of the fixes to be non technological, to push back and keep the interface a living thing rather than a simplistic machine. The re-formation of the Columbia River into an organic machine, using 19th and mid-20th century technology, was a bit of a failure. That can serve as a model (or anti-model) for how to proceed, now that a new technology is ascendent. So, no dualism, but duality, perhaps, like it or not, keeps things healthy on both sides. It's a conversation. The speakers take turns. That conversation is not randomly generated. It takes intent, plus the wisdom to know when to stop intending.